So on one hand I am listing cars to make space but on the other I need things to keep the devil from making work. No one wanted my Marvick Scout. It is fun but that wears off quick. I want a “true” scale truck for a bit. I could finish the CC-01 in the attic but it did not hit the right note for some reason. I could buy a CR-01 but is it real enough to be real and challenging enough to keep me occupied? I have been trawling and the SCX10 seems to been the poster child for affordable scale. I could buy a kit and upgrade it as I go along but an idea popped in to my head, please feel free to comment, constructive or just funny. Ebay is full of cheap HopUp bits for the SCX. I could get frame rails and alloy cross bits and try and transplant the Scout over. I know there are kits for this but where is the fun in that. The question is will I spend more than just doing it properly or end up with a NotAScout that is rubbish and worth nothing. There's plenty you can do with a CR01, well documented on rccrawler.com but if you're thinking about the Axial now, will you ever be satisfied?! Tamiya make nothing as good as an SCX-10II. I recommend you pick up their new Builders Kit. Leaves a bunch of stuff out so you can build it to your liking while saving a little and getting thins like the better links out of the box. PS, BC just beat me by 2 seconds lol. Nice to know that my thoughts are echoed by someone on here with waaaay more experience than me! I bought a Maverick Scout as a cheap donor for a scale project and converted it to a scaler using TCS X-Trail chassis rails, which was a good way to turn an AX-10 (which the Scout is based on) into a scaler before the SCX-10 came along. Gearing on the Scout is very low compared to the SCX-10, my SCX-10 will do a good walking pace with 120mm tyres but the Scout scaler on 106s is barely a shuffle. Can probably be fixed with gearing options but I haven't had the time or inclination to check it out. All I needed to do the job was the TCS X-Trail chassis rails, some 10mm Delrin sheet to make the front and rear cross beams, some threaded rod and rod ends to make the links and a set of shocks and some wheels and tyres. And a body, of course. If you're running 1.9s then you'll probably want to take off the axle guards and shave off the mounts for clearance. Be warned the mounts are not blind drilled, you will open up holes into the axles which you will have to fill. I used epoxy resin. TBH mine's a very capable rig. With the stock motor and gearing it's got buckets of torque. I use cheap alloy shocks with very soft springs - don't ask me what from, they were in my parts bin - and it's got reasonable clearance with plenty of flex. Articulation is actually limited more by me running a vintage Bruiser body with stock-ish wheel arches and not too much body lift than by the chassis itself. There is a slight issue with bump steer due to the upper link geometry on the chassis rails and axles. I ran it at the Scaler Nats and the G6 this year as well as at some local events and while it can't outclimb my SCX-10 G6 with its Class 2 tyres and body and loads of articulation, it still did exceedingly well in the Class 1 category. I don't have any pics of mine up at the mo (I'm waiting to do a photoshoot later this month) but if you wanted to make the best out of what you've got then it's a good option. Thanks that is great information. Another vote for the Axial. For me, I think it would come down to which transmission you want. The SCX10 II has a slipper, whereas the Scout does not. The gear ratio in the Scout is also significantly lower than the Axial. Pros and cons to each, depending on if you plan on doing more climbing/crawling versus trail running. I certainly would have purchased the SCX10 II builders kit had it been available a couple years back. As much as I love my Landfreeder...... Can I still say love considering its current state? As much as I loved my Landfreeder, it just wasn't a capable crawler. Flat trails, gravel roads, light bumps, small obstacles, and it was great fun, but anything bigger and it doesn't compare to the capabilities of what Axial offers. These are 2 different vehicles with different intentions. 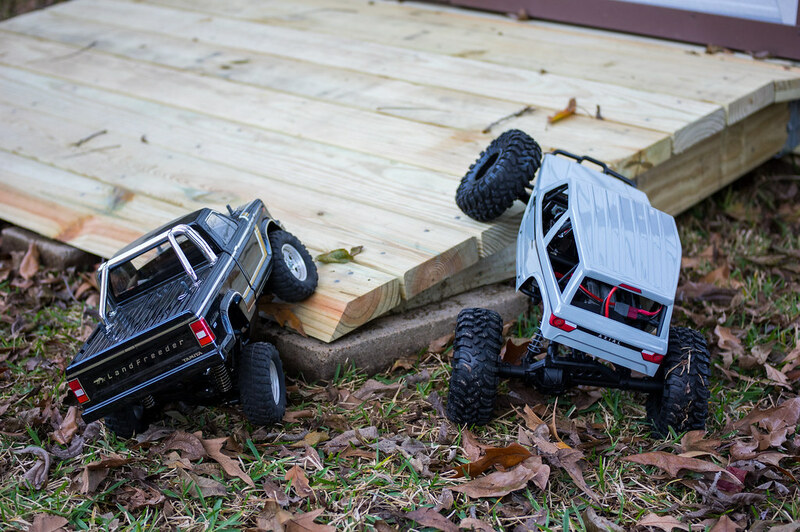 If you want a go anywhere, crawl over anything, vehicle, you could also consider the Axial Wraith. It's larger than the SCX10, and uses 2.2 tires. You can't deny that the Landfreeder has it beat in the looks department though.